When Vonage discontinued its free calling feature to Canada/US from its mobile app, I was just worried because we don't have any reliable app to make free calls across Canada/US. 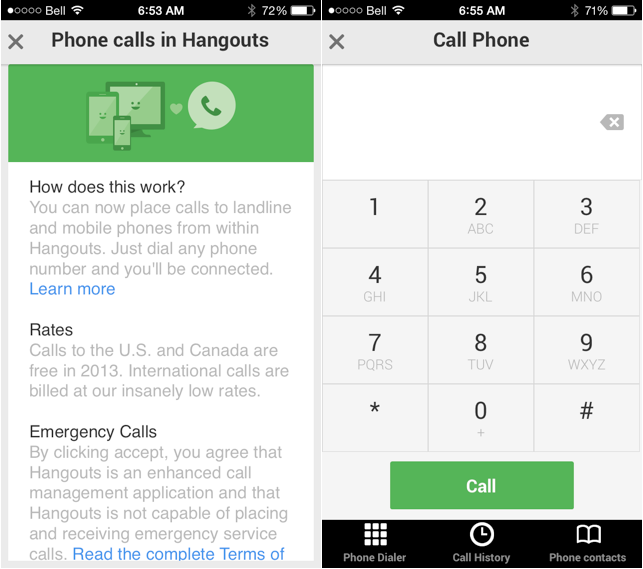 Thanks to Google for releasing an updated Google hangouts for iOS which features free calling across Canada & USA. Though there is no official Google voice app here in Canada, the latest hangouts app changes the situation and it's a good start. Users who retained their Google voice/Grand central number will make and receive calls from that number while new users in Canada will have their calls show up as 'Unknown'. Google Hangouts is definitely taking the place of skype.